Donner DUB­1 is not a model you will hear about too much. 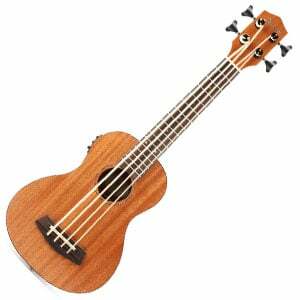 However, it is one of the most capable budget ukulele basses out there right now. Today we are going to give it a closer look and see just how capable this thing is. Without further ado, lets start. What might look like just another budget uke from a distance, turns out to be quite a treat when you decide to step closer. For starters, the entire thing is made of mahogany. Finding a full mahogany body in this price range definitely isn’t common so that’s a huge plus right off the bat. Donner did an awesome job in terms of build quality, quality control and attention to detail. Neck is smooth, extremely playable and features a decent rosewood fretboard. As a matter of fact, if you were to get DUB­1 as a beginner, spend time learning how to play and finally reach a more advanced level of skill, chances are it would still be good enough to keep up with your needs. That type of build quality is definitely not something you expect to see from an entry level model. Donner’s choice of hardware brings nothing unexpected or weird. They have stuck with what was proven to work. In other words, we have a pretty beefy rosewood bridge that houses a set of four fully adjustable saddles. In terms of tuning machines, we got a set of four die cast tuners made by Donner or a sub contractor of some kind. While they aren’t exactly the top of the line, they get the job done more than well. Last piece of hardware that we want to talk about is the on board preamp. 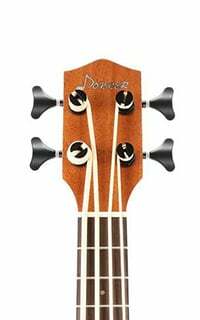 It is Donner’s own design which offers a three band EQ and a built in chromatic tuner. Just having that three­ band EQ makes it a pretty competitive piece of gear to have. If you are into tone shaping and don’t want to use various pedals, a proper EQ is a must have feature. When it comes to pure sound, Donner DUB­1 hides a number of surprises. 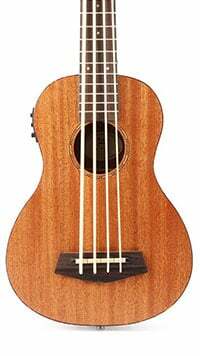 For a bass ukulele, it offer plenty of definition and a fairly tight sound. We can attribute this to the full mahogany body but also Donner’s choice of strings. With that in mind, you will find that DUB­1 packs quite a bit of range. Low frequencies have girth but aren’t muddy. As you go up and reach mids, the core of the tone remains to be tight. In some ways, DUB­1 has a very classic, acoustic bass vibe to it. Using the built in preamp yields great results. That EQ we’ve mentioned earlier makes all the difference in the world. It allows you to really adapt the tone profile you want. At this price, Donner DUB­1 meets and exceeds all expectations. It’s a great beginner model but also one that will serve you well in the future. Donner DUB­1 is the living proof that you can get pretty good performance out of a budget bass ukulele. Everything from materials used and build quality to sound makes it a great model to have. Especially at this price. We can definitely recommend it to both beginners and advanced players. For more info about the Donner Ubass DUB­1, click here.